Time for MORE Punctuation Power! Students often know the basics of sentence and paragraph writing, but they struggle with common punctuation rules which add sophistication to their writing. Not anymore! 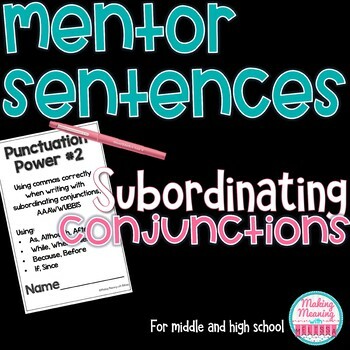 This resource uses mentor sentences to teach Commas with subordinating conjunctions (without all the technical grammar rules that don’t transfer into student writing). Students will learn to use and correctly punctuate AAAWWUBBIS, keeping all this information in a handy mini-book that is easy to hold onto. 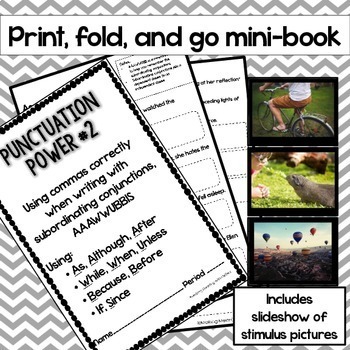 Included is a powerpoint of 28 stimulus pictures to give students inspiration for their writing. I've been using this method for over 10 years and it works beautifully! Students love seeing the added sophistication in their writing. • Please go to your My Purchases page (you may need to login). Beside each purchase you'll see a Provide Feedback button. If you click on it, you will be taken to a page where you can give a quick rating and leave a short comment for the product. Each time you give feedback, TPT gives you feedback credits that you use to lower the cost of your future purchases. Don’t you just love getting stuff for free?! I really value your feedback, as it helps me improve my products! ©Copyright 2015 – Making Meaning with Melissa. All rights reserved. 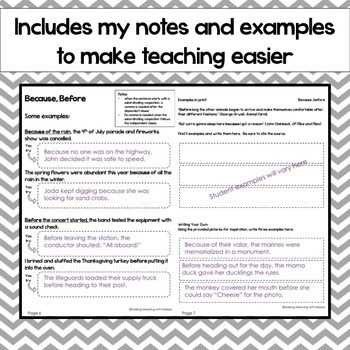 Permission is granted to copy pages specifically designed for teacher/student use by the original purchaser or licensee. The reproduction of any part of this product is strictly prohibited. Copying any part of this product and/or placing it on the Internet in any form (even a class website) is forbidden. Doing so is in violation of the Digital Millennium Copyright Act.